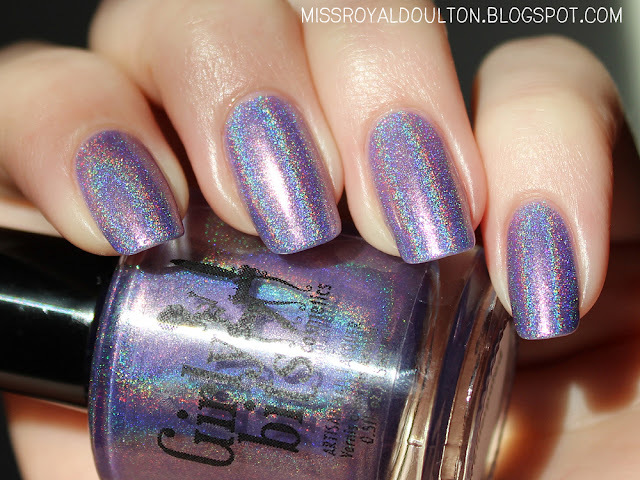 It was absolutely love at first sight with Girly Bits Twitterpated! Let's see, purple? Check. Holo? Check. Hidden pink-to-gold shifting shimmer? WHY HELLO THERE. Twitterpated is every kind of awesome all mixed into one polish! It's a gorgeous lavender color with strong linear holographic sparkle, and has a beautiful, subtle pink shimmer that shifts to gold. As you can see, the holo is very visible, and completely mesmerizing. In indirect lighting you'll notice more of the lovely pink shimmer and shift. The formula was just perfect! No streakiness or unevenness, just very smooth and easy to apply. Here I've used three coats, which covered quite nicely, although you may occasionally see the nail line peeking through. Here you can see some of the faint shimmer texture, and I think I even managed to capture the beautiful pink-to-gold shift that it has. The duochrome isn't very noticeable, but the pink shimmer certainly adds wonderful depth to this gorgeous lavender holo. The beauty and complexity of this color makes it one of my all-time favorite polishes! Girly Bits cosmetics can be purchased from her website, as well as many e-tailers such as Llarowe, Harlow & Co, and Mei Mei's Signatures. Like her on Facebook for specials and previews of new colors! Thank you! I agree, it's so pretty!